Start off with a jeans and tee basic look (it can be any style or color) and dress it up to show off your personal style with accessories, jewelry, and whatever you’d like to add. Layer it: I love layering especially during winter. It’s hard to see but I am wearing 4 layers in this outfit. I started with a plain white tank top underneath, a white button-down shirt, a basic sweater and a blazer. The key is to start with pieces that are made from thinner materials first then layer them with heavier items to avoid the bulkiness. Define your waist: Wearing a belt is a simplest way to dress up a casual outfit. The belt can immediately turn the plain T-shirt into something formal and more interesting. I rolled up my sleeves to add a feminine touch to this menswear-inspired outfit. Accessorize: A plain outfit doesn't necessarily mean that it must be a boring outfit. One piece of bold accessory can spice up any boring outfit. This Amrita Singh bracelet is the key piece to this outfit. I can’t tell you enough how much I love this bracelet. I bought it from Gilt a few months ago and I cannot stop wearing it. Since this outfit is kind of plain, it creates a nice backdrop for bold jewelry. Jeans and a T-shirt may seem plain and boring at first glance. However, there are countless way to dress them up. Experiment with what you have in your closet and see what works best for you. I am looking forward to see more inspirations from other fashion bloggers in this challenge. Don't forget to head over here to check out other fabulous entries. Great job with this challenge...I love all of your layering, and that bracelet adds the perfect pop of color! I like the sweater over the button-down. A great twist to preppy! Like you said, the bracelet is such a great touch for the outfit! I agree w/the bracelet. Pop!!! Bracelet is killer! Love the brown with the grey... You look so classy, as always! Love the bracelet! It seems to fit you really well. How big around is it? Love your outfit, Sydney. Your layering if flawless, adding interest to the outfit yet no bulkiness. Love the bracelet! Definitely a great purchase! This is such a classic, timeless look. Both Ralph Lauren and Burberry would approve! Love the pop of colour with your bracelet! The sweater is so interesting with the contrasting colours!! Looks like you're wearing two :D I love the layering, Sydney. Great job! My favorite kind of layered basics! Timeless and chic! I love your style! i'm so impressed with all of your layering! the belt really helps define your waist and i love the pop of color from the bracelet too! Oh wow Sydney - I love how you broke it all down and I really LOVE the preppy feel of this outfit! Great job! yep, you proved the basics aren't boring :) You look cozy too! Sydney I LOVE this! So cool how you managed so many layers without looking bulky, I will have to try this out! That is a gorgeous bracelet! Super classy! I also love the bracelet. I never would've guessed that you were wearing so many layers! It doesn't look bulky at all and your shape is still showing through. Gorgeous bracelet too, it totally pops on an otherwise neutral outfit. very pretty! i'm only 5'4" so i definitely support the 'cause', lol,..now following, i hope you can also! i would really appreciate the support :-) thank you so much! I love those jeans on you and the belted sweater is adorable! I can't believe you were wearing 4 layers! It doesn't look bulky at all. Gotta agree with you that to start out with the thinner pieces and work your way to the thicker ones on the outside. Such a clean, classic look! I am all for the belted anything look. You bracelet is very beautiful! With four layers I would 1) Look like the Michelin Man and 2) Sweat profusely (you wanted to know that, right?). You, hoevet, look great! The first layer with the shirt and sweater vest is my fav! Gorgeous! I really like your sweater Sydney! I think I might have the same one in pink, but now I'm wishing I'd picked gray instead! @mlynn The bracelet's diameter is 3 inches. I was afraid that it would be too big on me. Fortunately, the fit turns out to be perfect. I like your triple/quadruple? layering plus belt. It looks very comfy yet warm, and the Amrita Singh bracelet adds the perfect touch for Spring. I like her large stone pieces a lot...I hope to find something bright in a similar color! 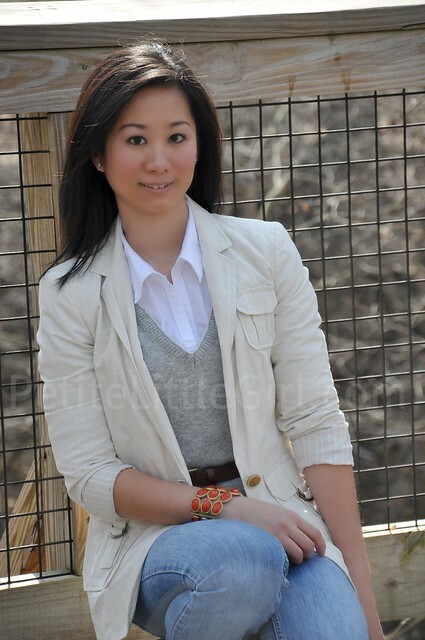 Love the casual layering look - I'm in love with the blazer and bracelet! I love your blog, just joined.. I did always think I was the only one having problems with clothes sizing! !your outfit are amazing, thanks for sharing! You're definitely right about the accessories, the bracelet looks great! The belt does help define the waist...I'm going to have to try that more with my outfits too!